Description: Beautiful Henri Delcourt bottle vase. 10 inches tall. Delcourt worked at Boulogne - sur - Mer in Northern France from 1913 - 1935. This one probably dates late 20's. This vase is in like new condition, but if you look hard enough in very strong light, you can find some crazing (no stains). Gun metal drip, with turquios, brown and red drip on a yellow body. So Cool! You can also find Henri spelled Henry online. 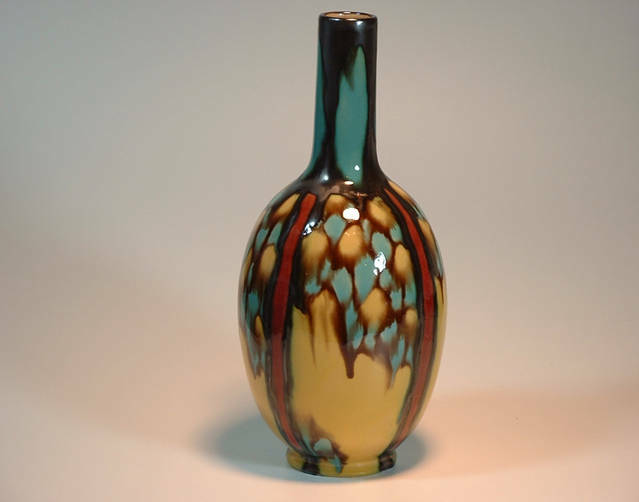 Click on delcourt keyword below to see other Delcourt vase.